Newton native Cam Meekins, 19, recently took best new artist at the Boston Music Awards. Sitting on the well-worn sectional couch at a friend’s apartment in the South End on a Saturday afternoon, Cam Meekins looks relaxed and a little tired, as one might expect him to be. After all, he’s coming off an eventful week: this past Sunday, he collected the award for best new artist at the Boston Music Awards at the Liberty Hotel and took his crew along with him to celebrate. Meekins is clearly enjoying the moment, and who could blame him? At just 19 years old and one year removed from his high school graduation, the Newton native has already had a productive four-year career by anyone’s standards. He looks back with humor at his first ever live show, which featured a 5:30 p.m. set time in the cramped confines of the Western Front in Cambridge with just his parents and few others in attendance; contrast that to now, when he has established himself as a popular act in Boston, with a post-Christmas show coming up on Dec. 26 at the Middle East, and on the college tour circuit. The early skepticism was eventually overcome as Meekins gained more experience and began releasing songs on YouTube and Facebook, earning himself a devoted young fan base. But his songs from two years ago, when white suburban-based rappers like Cambridge’s Sam Adams and Pittsburgh’s Mac Miller shot to fame with the support of a similar demographic, aren’t like the ones he's currently preparing for “Lamp City,” his formal debut record dropping in January via iTunes. Looking back now, Meekins admits he was still trying to find his sound, and that the ‘frat rap’ tag that critics attached to him never quite fit. But despite the exposure, Meekins never quite fit in with the rest of his peers, and beginning with his mix tape “1993” in 2011 and continuing with this year’s “Faces” album (“:) :( :/”), he began to push back against the preconceived notions that threatened to pigeonhole his career before it really took off. Comparisons with Mac Miller and Asher Roth are artfully dismissed on the Robert Frost-quoting, Thelonious Monk-sampling “Two Roads,” while “Run Away” showed a knack for effective storytelling. 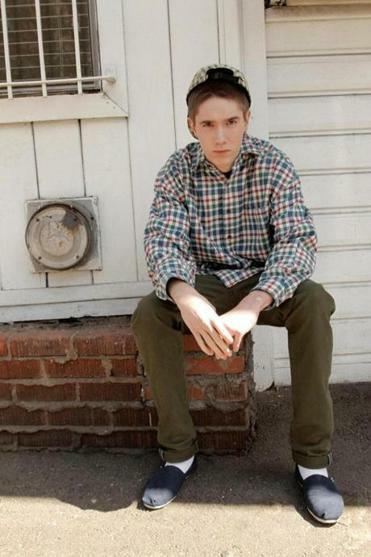 As Meekins began to come into his own, Boston’s young, new look rap scene began to embrace him in turn. As the group moves downstairs, Meekins pulls a laptop onto a dusty white plastic table with large speakers and begins digging into his iTunes library in search of tracks to play. As he cues up a track from “Lamp City,” the crew begins to nod along to the song’s breezy summer vibe, with verses strung together by a chorus that repeats the refrain of “life is good.” For an artist on the rise, it feels appropriate. After turning in a producer-of-the-year performance in 2012, Alchemist will start the new year backing up Prodigy of Mobb Deep for a show at the Middle East Downstairs on Jan. 11. . . . Former MTV reality star and living, breathing Internet meme Riff Raff, fresh off his Andy Milonakis-collabo record “Three Loco,” will perform at the Middle East Downstairs on Jan. 16.